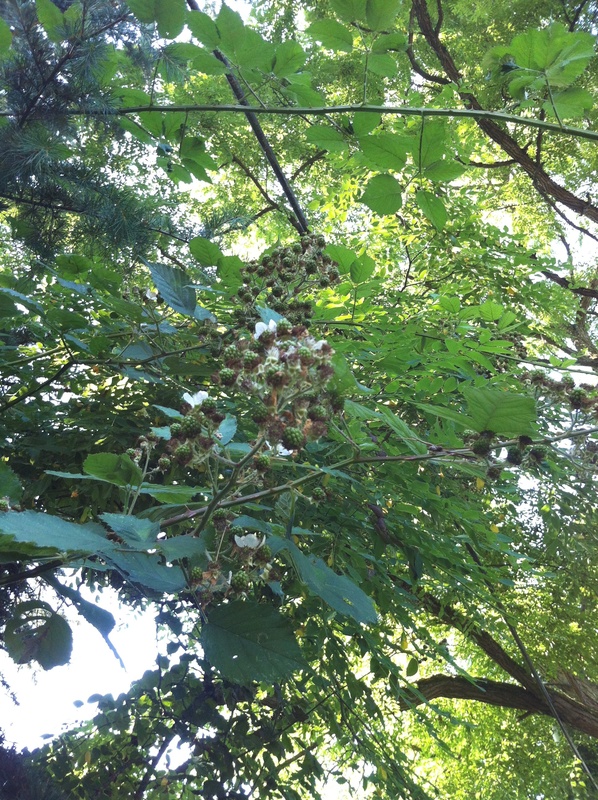 Living in the Pacific Northwest is especially wonderful in August, when it is officially our month of summer and there are ripe blackberries everywhere you look. Yes, people will tell you blackberry bushes are evasive and take over if you let them but I still love the fact that I have them in my front yard. I will only gripe about the thorns under the leaves and how they cut up your hands! 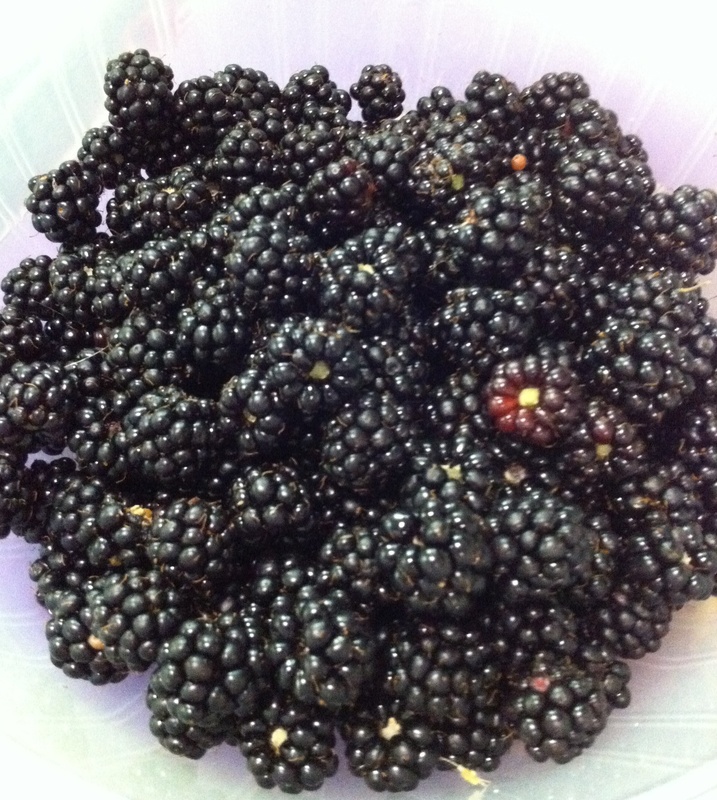 This is our stash of blackberries from our bushes and we didn’t even make a dent. Luckily they ripen in waves, so chances are you will be getting quite a few blackberry recipes from me the next few weeks. I apologize in advance but I can’t resist free food! 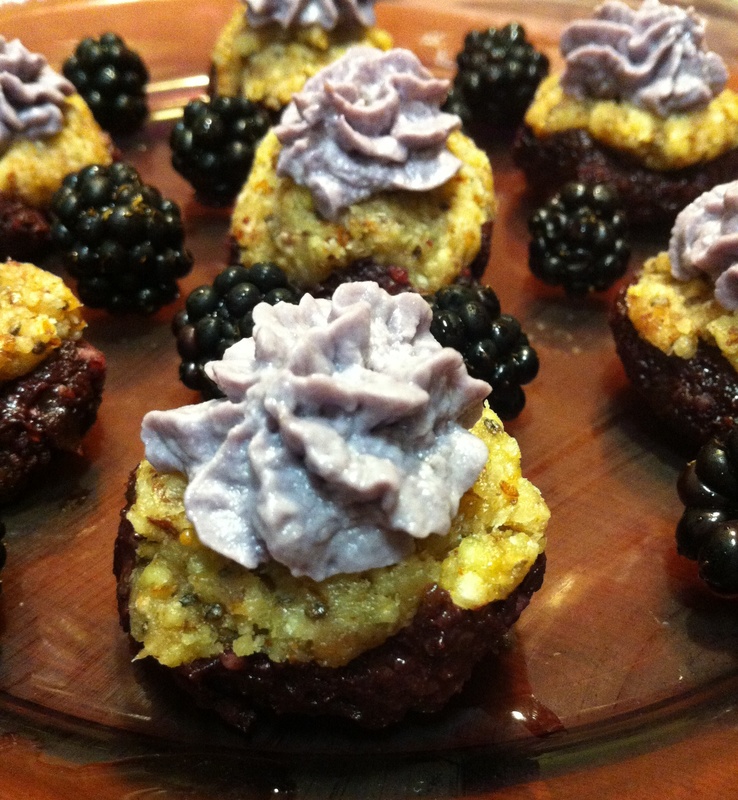 Let me know if you have a favorite blackberry recipe! So initially I was going to make these in mini cupcake tins but could only find the papers so filled the papers and then removed them and shaped the bites by hand. I think it would be much easier and esthetically pleasing if you used actual cup cake tins. This recipe makes 24 bites. If you are using cupcake papers you will need 24. Put all ingredients in food processor and blend until smooth. Refrigerate for 2 hours so that it stiffens. Mix chia seeds and water and let sit for 15 minutes. Set aside. Process almonds in a food processor until it is the consistency of almond flour. Add dates, sucanat, blackberries, cacao, and chia seeds and process until it becomes clumped together similar to a ball of dough. I recommend using the cupcake papers at this time. Scoop one teaspoon of blackberry mixture into each cup and flatten out the mixture. Repeat until all mixture is used. Set aside. Process almonds in a food processor until it is the consistency of almond flour. Add coconut, sucanat, coconut oil, and chia seeds and process until it becomes clumped together similar to a ball of dough. Scoop one teaspoon of coconut mixture on top of each blackberry mixture. At this point I covered a plate with parchment paper, removed the bites from the cupcake papers, molded them by hand and placed them on the paper. Repeat until all mixture is used. Set aside. Refrigerate for at least one hour. Once they have been refrigerated and icing has stiffened, place bites on serving platter and ice. Enjoy! Gallery | This entry was posted in dessert, Raw. Bookmark the permalink. Definitely actual cup cake tins might give a better look. But this too looks yum. Sounds quite delish.